Of all the ingredients I introduce to students in my Indian cooking classes, the one that holds the most fascination is the curry leaf. Most students have never heard of it before, and usually someone asks if they can grind it up to make curry powder. Curry leaves do not make curry powder when ground up on their own, but they are nevertheless an essential flavour component in many Indian dishes, including in some masalas (dry spice mixtures). They have a pungent aroma: a mixture of musk, citrus, and resinous garlic, with a faint curry-like flavour to top it off. Curry leaves are unlike any other spice in my kitchen. They are a must-have for me: their flavour positively addicting, bringing me back to my months in India, devouring scores of delicious meals perfumed with curry leaf. They are often what separates an authentic tasting Indian dish from one that is lacking in some way. The word “curry” comes from a Tamil word that means “sauce” or “gravy”. I therefore dub curry leaf the Awesome Sauce Leaf: the leaf that makes all sauces taste and smell amazing. 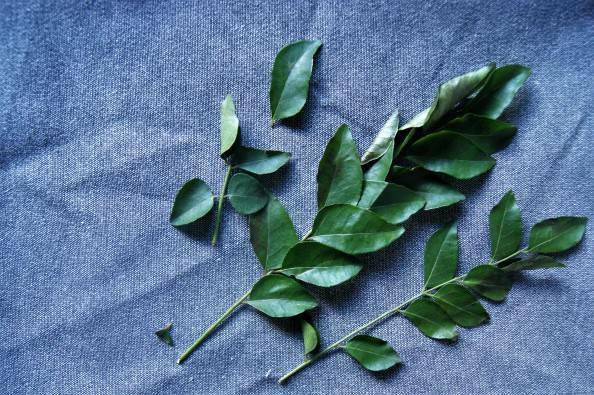 Curry leaves are usually sauteed in oil to release their essential oils, before being cooked into a dish. This can happen either near the beginning or near the end of cooking. 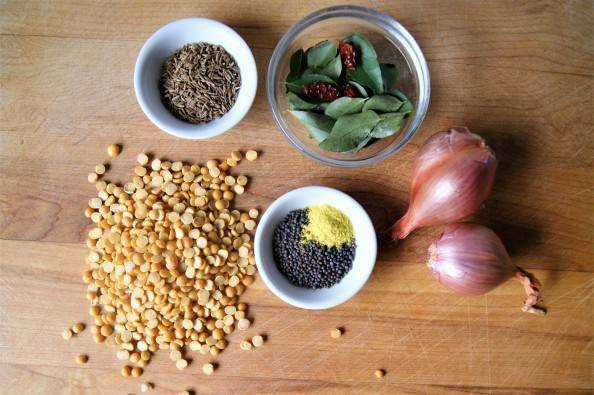 If it happens near the end (as in the recipe for South Indian Dhal in this post), it’s an important spice-tempering technique known as chaunk (Hindi), baghar (Urdu & Bengali), or tarkha (Punjabi), among other names. Curry leaves can be eaten after cooking, but most often, I move them to the side of my plate as I eat. Smaller ones are more delicate and easily eaten, but bigger leaves are tougher and best to leave aside. When I can, I buy curry leaves fresh. The rest of the time, I make do with dried. Dried curry leaves are far less aromatic and flavourful, so I double the amount when using them in recipes that call for fresh. When I do find fresh curry leaves, I usually buy much much more than I need, and dry or freeze some for future use. Curry leaves keep about a week or two in the fridge, about 6 weeks in the freezer, or about a year dried. Fresh curry leaves can be found in Victoria occasionally at the following places: The Root Cellar, Fairway Market at Quadra/Hillside, Gobind Food Market, and Fisgard Market. In Vancouver, they are always available at South China Seas Trading Company, or numerous stores in Little India (49th & Main). Dried curry leaves can be found at any Indian or Middle Eastern Spice store. LAST WEEK’S WINNERS ARE: Lorena Lennox; Lisa Durkin; and Julia Oland from the blog; and Debra Fitzimmins from my facebook fanpage! 3. Four discounted cooking class spots will be available for a draw each time I post for three weeks. That means there are 3 chances to win! 4. Enter the draw by commenting on the blog post or on my facebook fanpage that day. A new blog post will go up every Sunday for three weeks. 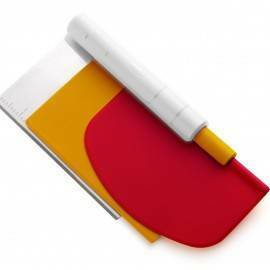 Each draw will last for 48 hours, after which I will close comments and pick the winners by random draw. 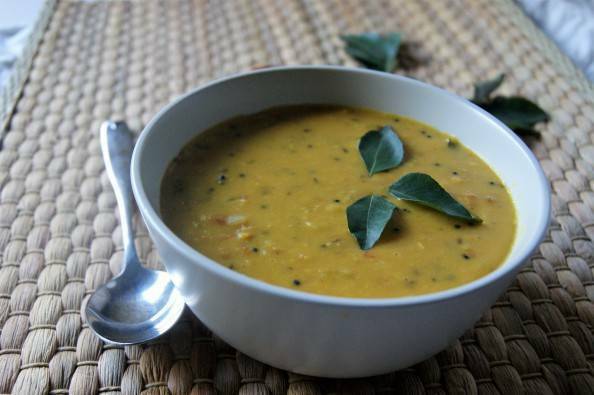 This delectable dhal is a classic South Indian recipe. Most of its flavour comes from a chaunk (spice temper) poured in at the end. The earthiness of the cumin, the sharp pungency of the mustard seeds, the aroma of the curry leaves, and the warm spice of the red chili is a fantastic foil for the slightly sweet lentils. Serve with rice, flatbread, and a vegetable to make a full meal. Rinse the split peas and lentils well in several changes of water, and drain. Place in a medium-sized pot with the 4 cups water, the salt, and the turmeric. 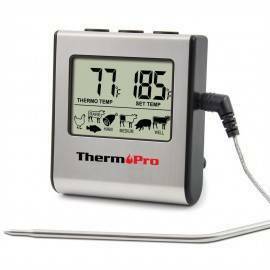 Bring to a boil over high heat, skimming any foam or scum that forms on the surface, reduce heat to low, partially cover, and simmer, stirring occasionally, for 45 minutes. Add the ginger and ground cumin and continue to simmer for 20 to 25 minutes more, stirring more frequently as time goes by, until the split peas and lentils are completely soft and breaking apart. Add up to 1/2 cup more water if the mixture seems too think. Meanwhile, prepare and measure all of the remaining ingredients and arrange them in little dishes like so: asafoetida and mustard seeds in one dish; cumin seeds in another; red chilis in another; ghee and curry leaves in another; shallots in another; tomatoes in another; and water in a little measuring cup. The cooking of the spices goes VERY quickly, so it is imperative that you have everything measured and ready by the stove. When the lentils are ready, heat the oil in a saucepan on a separate burner over medium-high heat. Have a lid for this saucepan ready! When the oil is hot, add the asafoetida and mustard seeds and immediately cover with the lid. The mustard seeds will sizzle and start to pop, and they will fly out of the pan if it is not covered. Once the mustard seeds have popped for about ten seconds (long enough for them to have mostly popped, but not long enough for the popping to have died down), add the cumin seeds, let sizzle for about 5 seconds, then add the chili. Stir once, and add the curry leaves with the ghee. Stir until fragrant, about 5 to 10 seconds, then add the shallots and saute for about 2 minutes. Turn the heat down to medium, if necessary, to prevent the shallots from burning. Add the tomato and the water and cook for two or three minutes, until everything looks and smells wonderful. Pour this mixture into the cooked split pea/lentil mixture, scraping every last bit of goodness with a spatula into the pot. Stir the spices into the lentils, add the lemon juice, and simmer very gently for about 10 minutes before serving. 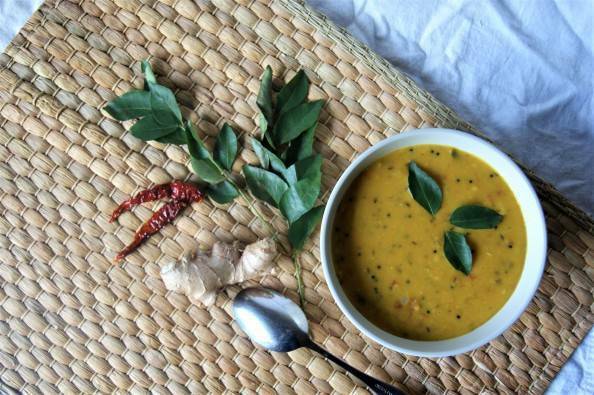 For a super decadent South Indian Dhal, add the coconut milk before serving. 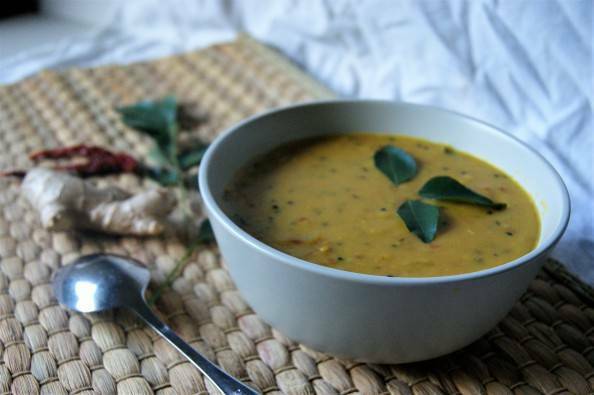 If not adding the coconut milk, you may want to add a bit of water to the dhal. It’s supposed to be thick, but not ridiculously so. I found fresh curry leaves at Fairway at Quadra and Hillside a few weeks ago when I couldn’t find them at the root cellar, also when I discovered the Indian Food Mart was no longer in business. Please enter me for the draw too! oooh, thanks for the tip! I’ll add that to the post! Thanks for info on where to buy curry leaves. Please submit my name to draw. Looking forward to trying this recipe. Please enter me for the draw. why do the curry leaves only last 6 weeks in the freezer but much longer dried? I would have thought the freezer would preserve the oils better. Richard, it’s because curry leaves are so delicate compared to other leaves we might freeze (e.g. lime leaves). They start to, well, disintegrate and get slimy, much like other fresh herbs might. Their aroma starts to dissipate, too, after about 2 months. So, yes, freezer is usually best for aromatics, but not always. I have often thought of freezing the curry leaves in oil, the way I do basil. Something to try next time! 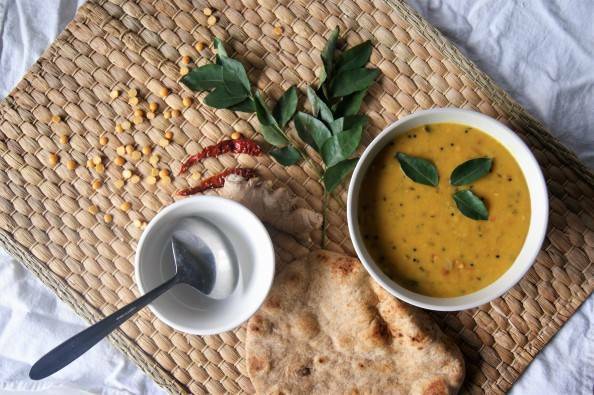 This dhal looks fabulous. 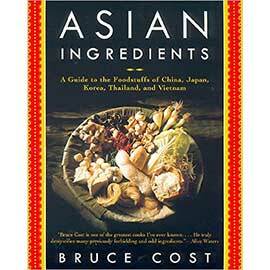 I really want to try making it…..and curry leaves will be a new ingredient in my kitchen. Having taken and utterly enjoyed an Indian cooking class with you Heidi, I hope I get to again. I made a new friend at the last one and we got together and recreated the whole dinner. It was both fun and delicious! Hi Francine, I missed the second half of your comment the first time I read it. That is SO GREAT that the two of you got together and re-recreated the menu! Awesome! Thanks for the reminder about curry leaves! I will look for them fresh! This recipe sounds so delicious! Please enter my name for the draw. Hi. I’m loving the freshness of the real deal leaves compared to the canned variety. I believe you can purchase real curry leaves also at the new Whole Foods store here in Victoria. I used to have to save up my shopping list for when I travelled to Vancouver to visit Whole Foods there. We’re lucky to have a new store here in Victoria. The dahl looks so yummy. 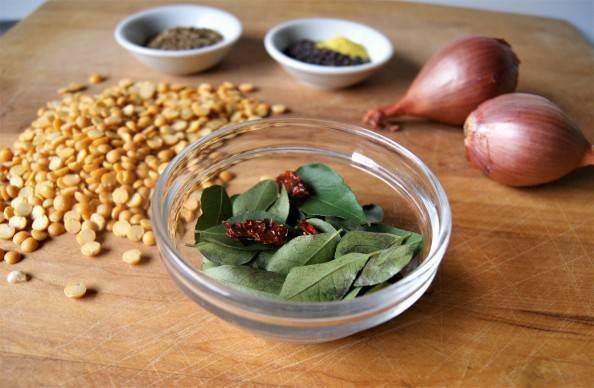 Thanks very much for sharing this recipe and the information on curry leaves. Sounds like a great recipe to try – please enter me for the draw. My husband LOVES dhal! I’ll have to give this recipe a try. 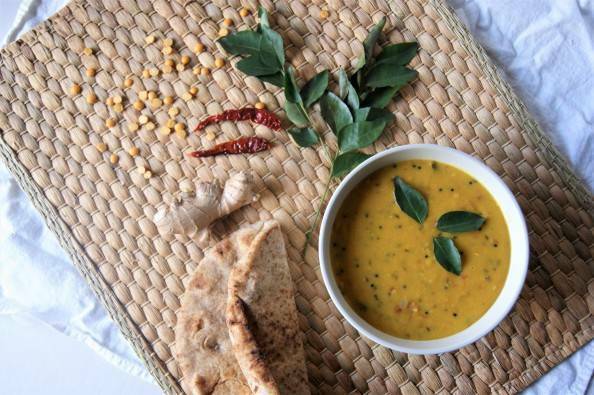 I am intrigued at this dhal recipe asking for as many as 25 curry leaves. I might have usd 2-5, I hope it’s not a misprint. look forward to trying it soon. Thanks Heidi.